You’ve probably seen them in countless photographs and illustrations of the Great Wall, and you’re probably aching to see them in person on your Great Wall hike. Read how and why these magnificent structures were built and maintained. A. Hollow watchtowers: As a kind of defensive construction, the hollow watchtower was creatively built after Qi Jiquang was named Garrison Commander of Ji Town and saw to the strengthening and construction of the Ji Town Great Wall. The watchtowers were generally located in the commanding height inside the rampart whereupon battles could be easily supported. One ach of the four sides of the hollow watchtower, there is an arrow window. The flat shape of the watchtower is square or rectangular, about 12 to 15 meters high. Some watchtowers are taller. Their length and width are different according to the terrain and the need for defense and offense. The watchtower often has two or three floors. The top floor is in the air with a battlement and a movable wooden watch tower for shooting and the patrol’s warning and communication with smoke and fire, lanterns and flags. The middle floor was for the defender to shoot the enemy. In the wall there are arrow windows and crossbow loopholes for watching and shooting to all directions. The base floor was the boarding house for the soldier, and also could store weapons, provisions, drinking water and other implements of war. Between floors there are stone or wooden stairs or rope ladders. Hollow watchtowers were distributed according to the terrain. They were footholds for the garrison. B. Wall platforms: Wall platforms are also called “horse faces”. They are outward protruding platforms on the rampart built with certain distance in between. Wall platforms are as high as the rampart. The three sides of the platform were all exposed to the enemy, and thus on each side there was a battlement. When the enemy was coming near and prepared for climbing up the rampart, defenders would shoot them sideward from the platform with crossfire. “Xingcheng” mentioned in “Bei Ti” and “Bei Gao Lin” in Mozi is the wall platform. In the Warring State Period the wall platform had been widely used for rampart defense. On Many Ming ramparts there are movable wooden watchtowers for the patrol to hide themselves from gale and rain. The distance between every two wall platforms must ensure the effective firing range. After Qi Jiguang had built hollow watchtowers on ramparts, wall platforms became a supplement to the vacuum between watchtowers. C. Beacon Towers: Beacon towers are also called “fire mound”, “beacon watchtowers” and “wolves’ dung mound” with a shape of a square, rectangle or circle. They were built for the need of military vigilance and information communication. They have a longer history than The Great Wall and served as an important part of The Great Wall defense system. Beacon towers were mainly built with rammed loess, stones, earth adobes or bricks, among which the first two were the most frequently used materials. The building material is roughly the same with that of the rampart in the same area. In Gansu and Xinjiang there are left many beacon towers of the Han Dynasty. Most of them were built with rammed earth, the cross section of which is like a square with the side length of 6 to 7 meters. The remaining height is about 8 meters. To the south of the beacon towers there would be houses. Today some houses are still there. Around the beacon tower there are sites of land reclamation by garrison troops. The beacon towers on both sides of the brick-laid Ming rampart were mainly built with stones. Only a small amount of them were built with bricks. The dimensions of the beacon tower were decided by concrete situations. The length and width of the Ming beacon towers are 5 to 8 meters, and the height is about 6 meters. The bottom is larger than the top, reducing in certain proportion. On the top there was built a guard house. Differences between the brick-laid beacon towers and the stone-laid ones lie in that the former ones after the walls were built with rubbles and the base with standard block stones, grey bricks were laid layer by layer and white mortar were used to fill up the joints. There were three kinds of Ming beacon towers according to functions. 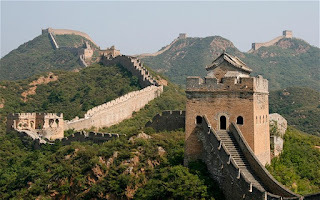 One was along and close to The Great Wall, called the neighboring beacon tower” or “the side mound.” The other was centered on and radiating from The Great Wall, called “the external beacon tower” or “the external mound”. Still another was centered on The Great Wall and extended to the Army and Government Office and Guardian Station inside The Great Wall, called “the internal beacon tower” or “the internal mound”.